Exceptionnally location for this charming little Parisian Hotel situated in the heart of the 8th district city walking distance from the district of Madeleine, Concorde Square, Opera Garnier, Elysée Palace, Champs-Elysées, Grand Palais, Tuileries Gardens, Jeu de Paume, the Louvre, Luxury boutiques of the Faubourg and the Rue Saint-Honoré with every Fashion designers (Hermès, Chanel, Dior...), Department Stores (Printemps, Galeries Lafayette) Embassies and Government officies... You'll enjoy having a warm and nice confort in this amaizing area for a business or a leisure stay in Paris. Whether on the rue de Surène side or the patio side, the Alison Hotel provides 34 guest rooms equipped with every convenience, including private bathroom with bath/shower/WC, Satellite TV with Canal+ and foreign channels (Canal+, Canal+ VO, Canal+ Sport, RMC 1234, RMC Sport, Raï, Eurosport, CNN, BBC, TVE Int., CCTV-4), minibar, direct phone line, modem connection, FREE WIFI access, private safe and hairdryer. - 4 connecting rooms and rooms with balcony are available on request. - Baby cots available on request at the time of booking, free of charge. - The reception staff speaks English, Spanish and Italian. 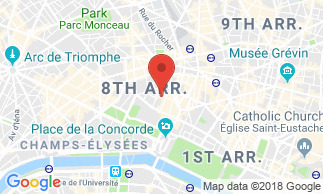 The Alison Hotel is located in a very prestigious area of the Madeleine, the Champs Elysees, the Louvre, Grand Palais, Art galleries, department stores, Tuileries, Embassies and government officies. Enjoy a nice full continental breakfast under the natural stone vaults. Can be served in the room from 6.45 am to 11.00 am without extra charge. City tax not included in the rates: 1.88 EUR per person and night. Hotel Alison Excellent hotel in a superb location with friendly and helpful staff. Hotel Alison Located in a rather quiet street and close to the Madeleine(5 minutes walk), we did not suffered from the traffic noise. Style of the room a little dated but very clean. Hotel Alison For a single traveller wishing to stay in this part of Paris, it would be difficult to find better value for money. The rooms are on the small side and modestly furnished, but thoughtfully arranged to give maximum comfort and convenience. The bathrooms are well equipped and totally acceptable. The location, on a small one-way street opposite a primary school, is very quiet. I live in the country so I am sensitive to urban sounds and, during a three night stay in a room overlooking the street, did not once hear any traffic noise. Service is discreet and efficient. Cannot comment on breakfast as I did not have it. Hotel Alison It's a small hotel, well located and the service is attentive and friendly. Breakfast could be improved. Hotel Alison A fantastic location. Small room but very comfortable, everything we needed. Good clean, en-suite. Nice and quiet, enabled us to have a good nights sleep! Hotel Alison Very clean and very well situated hotel.